Ducati is a brand known for high performance … particularly road racing success in every category, including WSB and MotoGP. 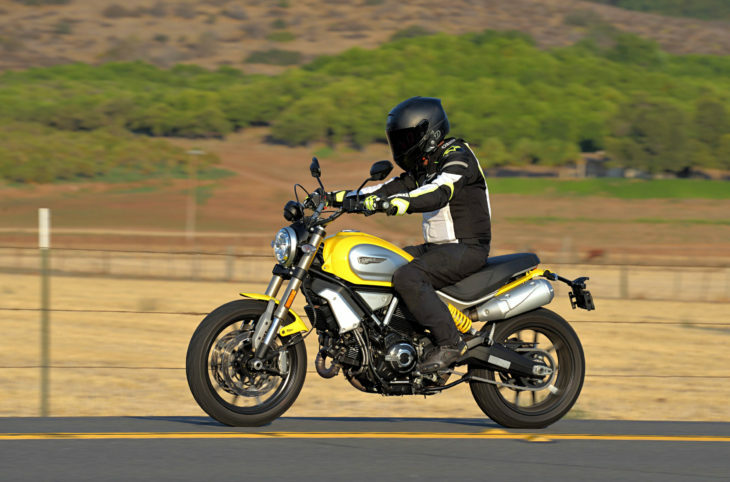 Since 2014, however, Ducati has been known for something else entirely, and that is the sales success of its simple, lifestyle-motorcycle, the Scrambler. 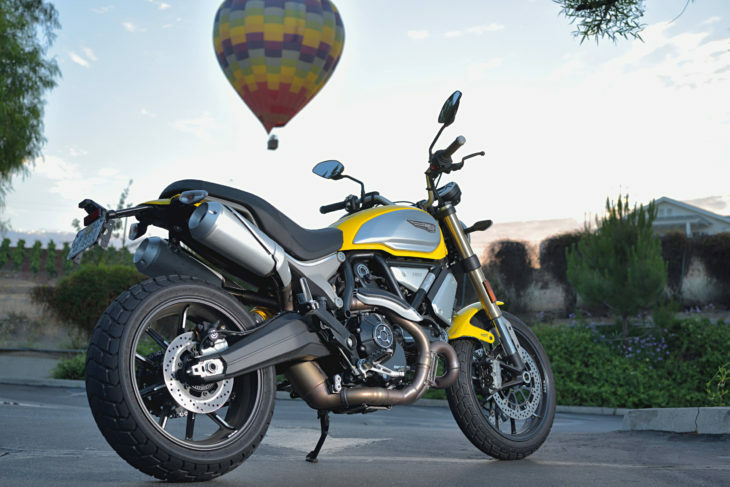 Now Ducati’s best selling models, the “Scramblers” are becoming something of their own brand … within a brand. 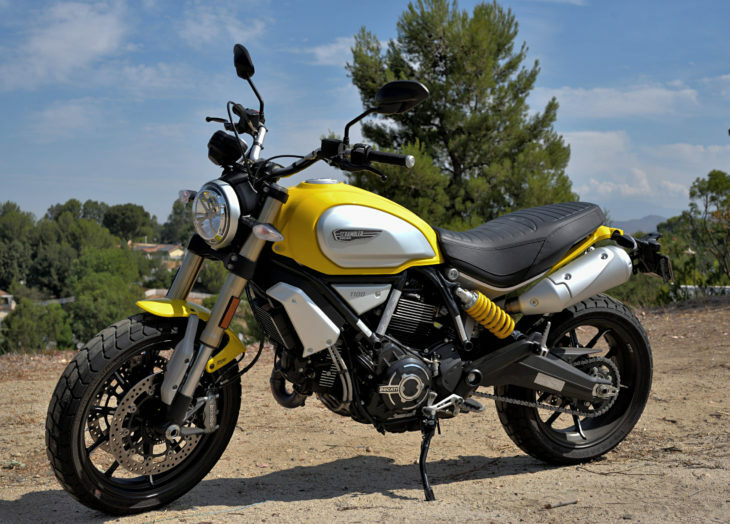 Is it the “Ducati Scrambler”, or simply the “Scrambler”? Ducati seems to be pushing things towards the “Scrambler” moniker standing alone as its own brand. In any event, Ducati struck gold with the original Scrambler, which featured an air-cooled, 803cc v-twin with a basic throw-back design. The Scrambler Icon we tested, despite a single front brake disc, non-adjustable suspension, and essentially no electronic wizardry, was a fun motorcycle that definitely hit the sweet spot when it came to styling. You might think Scramblers have been primarily bought by hipster millennials, but we understand the demand has spread across many age and demographic groups. What the original Scrambler lacked was performance, both engine and chassis, that might interest (excite, even) more experienced riders accustomed to more powerful motorcycles. So a bigger, more powerful Scrambler with more capable chassis was a logical addition to the family. Enter the 2018 Scrambler 1100 that is the subject of this test. 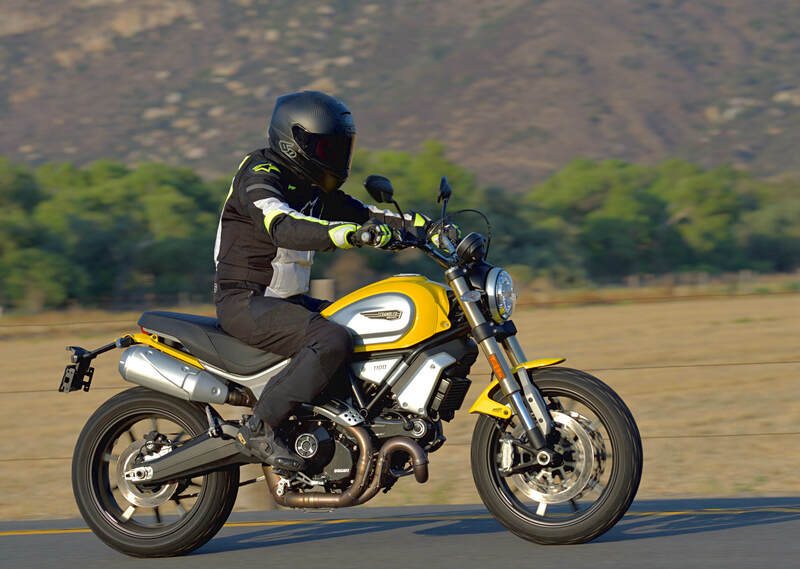 It seems an air-cooled engine is an essential element in a Ducati Scrambler (in addition to the trademark steel tank with brushed aluminum side panels), and the Scrambler 1100 carries a very good one. The 1,079cc v-twin is based on the two-valve unit recently used in the Monster 1100 Evo. Versions of this engine have put out close to 100 horsepower, but Ducati rates the Euro 4 compliant Scrambler 1100 at a peak 86 horsepower (achieved at 7,500 rpm). Together with a claimed 65 foot/pounds of torque at 4,750 rpm, the 1100 may not look like a speed demon on paper, but it is nevertheless a big step up from the power and torque offered by its 803cc sibling (which Ducati currently rates at 72 horsepower and 49 foot/pounds). It’s not just the 20% increase in peak horsepower and 33% increase in peak torque, it is the fact that power comes on at significantly lower rpm levels in the 1100. Still relatively light at a claimed curb weight of 454 pounds (with the 3.9 gallon fuel tank topped off), the Scrambler 1100 promises very good, immediate thrust at streetable rpm levels. As we found out, it delivers. Even bigger changes, perhaps, are found in the sophisticated electronic aids and upgraded suspension and brakes. 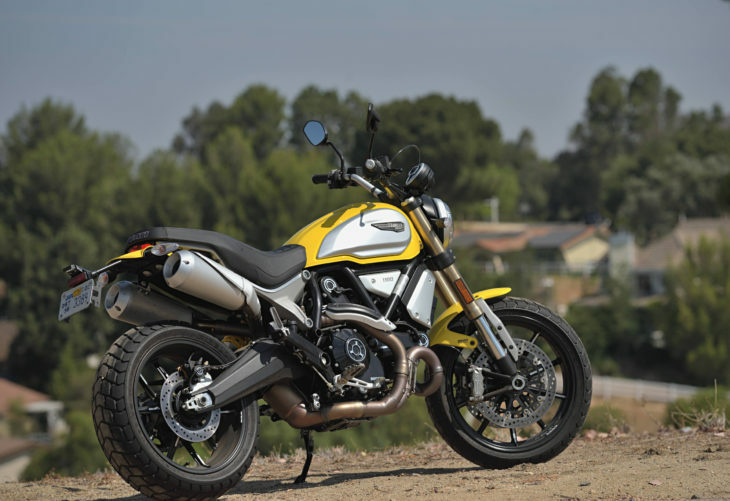 Compared to the relatively basic Scrambler 800, the Scrambler 1100 gets state-of-the-art rider aids, fully-adjustable suspension and top-drawer Brembo stoppers. Ducati created an all-new steel trellis frame for the Scrambler 1100 and hung some nice suspension from it in the form of a beefy, fully adjustable 45 mm, Marzocchi fork, and a Kayaba shock adjustable for spring preload and rebound damping . In addition, sweet, radial-mount Brembo M4.32 calipers squeeze big 320 mm discs in front, while a single 240 mm disc resides on the rear wheel. This is superbike-level stuff. Speaking of superbike-level stuff, the Scrambler 1100 gets the latest electronic wizardry. A Bosch IMU works to inform the performance of four-level traction control (that you can turn off) and cornering ABS. The bike also features three ride modes and three power modes. The ride modes are called Active, Journey and City. Active and Journey provide full power, while Journey softens throttle response. City limits peak power to 75 hp, and further softens throttle response. A six-speed transmission delivers power through a 17″ rear wheel holding a tire sized 180/55. The front wheel is 18″ holding a 120/70. The stock tires fitted are decidedly not superbike-stuff, and consist of Pirelli MT60RS dual-sports with a dirt-oriented (read semi-knobby) look. The traditional-looking flat seat provides good comfort and support, and the rider triangle of the Scrambler 1100 yields an easy reach to the bars with footpegs neither particularly high or low, and a bit forward from where you might expect them. After a short period of acclimation, the cockpit position seems to work well on longer rides, and even while sport riding in the twisties. Ground clearance is surprisingly good. Clutch pull is much easier than many Ducatis I recall, and engagement is smooth and predictable as you pull away from a stop. Power starts to build in a linear fashion just above idle, and the bike pulls hard at street rpm levels all the way up to 8,000 rpm. Meanwhile, the 90° v-twin sings a beautiful song from the intake and exhaust — leading the rider to wonder how Ducati passed noise emission regs. The stock bike is pretty loud. At first, handling seemed a bit unsteady when riding the bike hard, and cornering, but a relatively simple fix was available in the form of shock spring preload. Adding a healthy 3-1/2 turns to the threaded spring collar seemed to transform a bike with relatively lazy steering geometry and longish wheel base into a corner carving delight. Straight line stability remained excellent, at the same time. Keeping in mind that our test rider is 200-plus pounds, adding shock preload might be a typical way to balance a bike underneath him, but here it also seemed to quicken steering and improve feedback from the front tire. Set up this way, the bike cornered superbly. Even riding with a supermoto-mounted friend on a twisty mountain road, the Scrambler 1100 had no trouble keeping up mid-corner, and then could blast ahead on the straights. The dual sport Pirellis were a big surprise. They look like they wouldn’t work particularly well on the street, but they provided good grip and feedback. Of course, more street-oriented rubber should improve handling further, but we did not get a chance to explore this option. The suspension did an excellent job of providing a comfortable ride, including absorption of small stutter bumps, as well as sufficient damping for performance riding. The adjustment clickers on both the fork and shock seemed responsive, and helped us dial in the suspension to our liking. Probably the best suspension we have yet sampled on a Scrambler-style motorcycle. It doesn’t take long to describe the braking performance on the Scrambler 1100. One word comes to mind. Phenomenal. The superbike-level Brembos lived up to their reputation with huge power and excellent modulation. Mind you, these are not brakes for a ham-fisted beginner rider. Initial bite is pretty strong, and the sophisticated ABS can come in handy … even on dry roads. Again, this is not your typical brake set-up on a Scrambler. We tried both the Active and Journey engine map settings. Journey offers full power, but lazier throttle response. We preferred the Active mode, although some riders might consider it a bit too abrupt. We felt Active was plenty smooth enough, and brought out the full character of the air-cooled v-twin. The engine character is a story in itself. You may realize that Ducati spent years (decades, even) perfecting the air-cooled 90° v-twin engine configuration, as discussed in our 2002 story.The apex of that design/development process is likely the 1100 EVO engine residing in this Scrambler. This motor is simply fantastic on several levels. Fueling is spot on, and the extremely broad spread of power perfectly compliments the wonderful character provided by the individual, 540cc pistons banging away beneath you in perfect 90° harmony. This is a je ne sais quoi you have to experience for yourself. 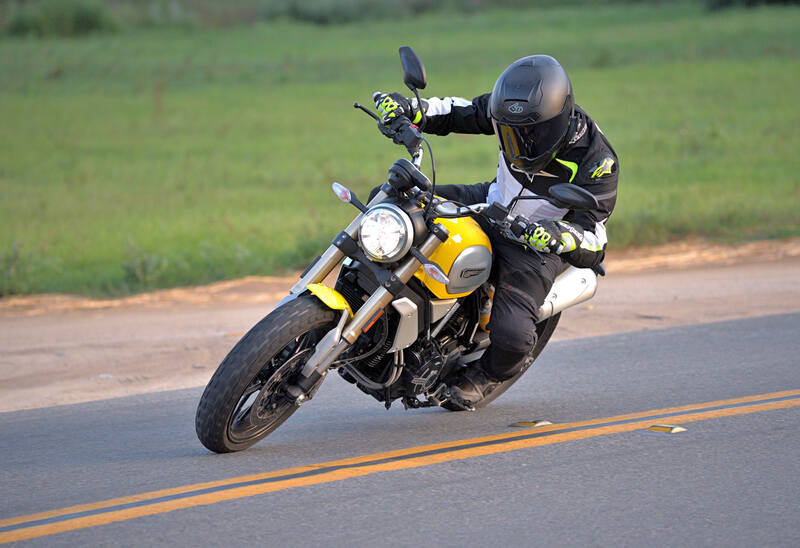 Like most, modern, large-displacement v-twin powered motorcycles, the six-speed transmission in the Scrambler 1100 is arguably overkill … leaving the rider with a frequent choice of gears on corner exits, for example, and a relaxed, loping cadence at highway speeds. Vibration is never an issue. The Scrambler gearbox shifts easily and positively, perhaps just short of the even more languid effort required by most Japanese gearboxes. In the end, the author began to fall in love with the Scrambler 1100. It has an indefinable character that drew me in, together with excellent performance that surprised me. It is comfortable, easy to ride, practical and rewarding. In fact, I began to feel my attraction to the Scrambler 1100 was somewhat irrational until it was time to take photos for this story. Serving as photographer, I invited Kent Kunitsugu, long-time editor of Sport Rider magazine and an Isle of Man TT race veteran, to ride the bike for photos, and put some time on it as we moved from spot-to-spot, eventually ending up at In-N-Out Burgers. Kent liked the Scrambler 1100 and seemed to agree with my conclusions regarding its handling/cornering abilities. He also carried a similar appreciation for the attraction of the EVO engine. I even began thinking about a long-term relationship with the Scrambler 1100 … making useful modifications to the machine in my head. The excellent chassis/suspension/brake package, coupled with the low weight one might expect from a trellis-framed, air-cooled Ducati, seemed like a fantastic starting point, and I fancied ways to get the dry weight under 400 pounds (pretty good for an 1100). All powerful indications I was smitten. We tested the standard Scrambler 1100, priced at $12,995 in the United States. Two additional models are available, including the Special ($14,295) and the Sport ($14,995), which gets Öhlins suspension. 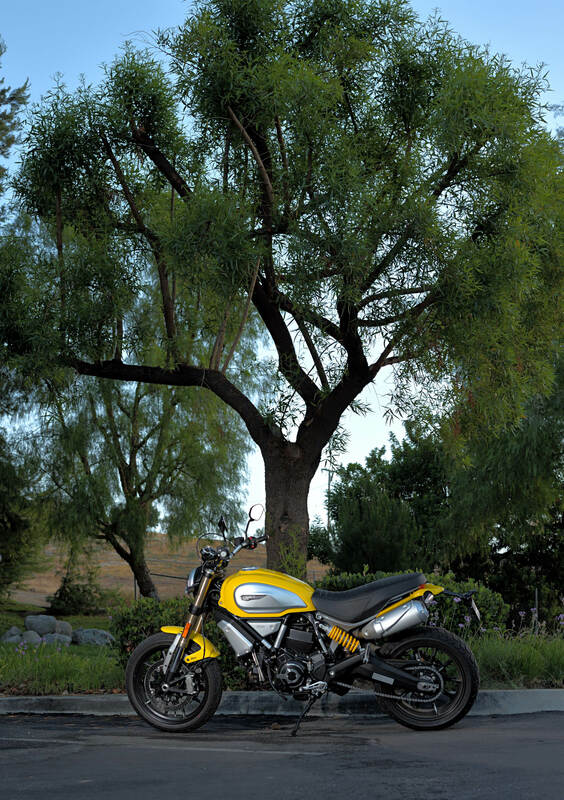 Take a look at Ducati’s Scrambler website for additional details. The local Ducati dealership (MCC Motorsports, Villa Park, IL) offered test rides earlier this summer on the first 1100s. The bikes looked very nice and performed well. The only thing that caught me, and perhaps it’s because the engines were new, was the amount of blueing on the exhaust pipes. Those engines must be running hot to do that in a short amount of time. Other than that, they were really quick and responsive machines. I’d like to see one in the Rollie Sands scheme. really thinwall tubing. single-wall of course. The japs know how to do it right – double-wall exhaust. The exhaust, tank and headlight remind me of a Honda 919 for some reason. Sure are lots of parenthetical statements. I would like to see a comparison with the old Multistrada 1000…style versus function. First Ducati I would consider buying. Looks like a fun one. Dirck, that seat looks extremely plush. Is it even half as comfy as it looks? Also, what sort of fuel mileage are you seeing with this bike? Seat is very comfortable. Mid-40s mpg. Considering the way you typically ride bikes like this during your test stints, mid-40’s mpg is very good indeed. I’ve still never owned an Italian bike. I don’t really like the looks of this bike very much, particularly the seat/tail section/exhaust pipes/license plate extension, but I’m pretty much past the point of caring too much about those sorts of things. Overall, it looks decent enough, I suppose. This could be my first Italian bike. 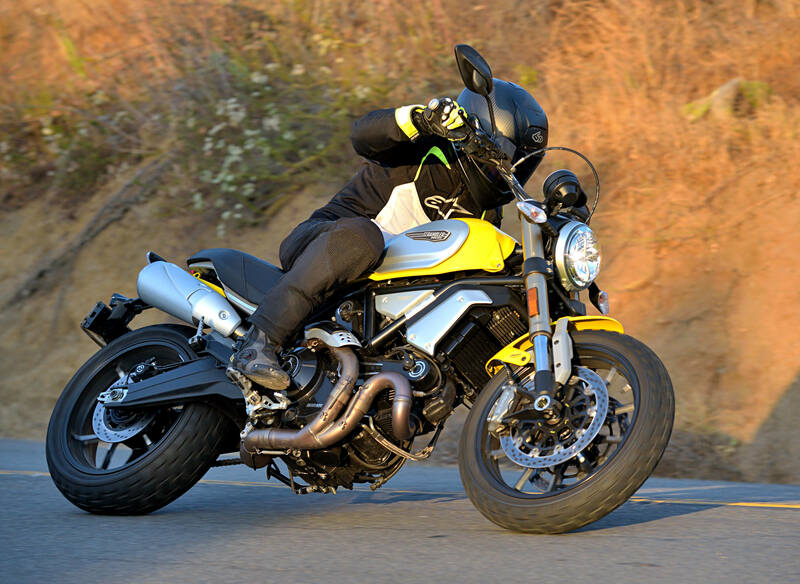 The Monster 1200 is also a possibility, but the seating position on this one looks to be a whole lot better for me, plus I prefer its relative simplicity. I’m glad this bike functions well, because it is ugly as hell. I know styling is subjective, but why do they insist on making it look like a Kenmore refrigerator from the 1950s? My ’07 Suzuki Bandit had 80 torque at 3k rpm. I would have thought a big twin like this would have had more usable motor, I guess not. Strange how the tester thought it had a lot. Why have to spin it up to get some torq, if its a twin? but your bandit carries 100+ more lbs vs this Scrambler (550 lbs vs 460 lbs) so it’s natural it feels more torque. Cruising at 60mph, in high gear, the extra lbs isnt noticable, when you pin it. The extra torq is. Considering one would have to downshift twice with the duck, to get it to spin up and have the same. In a high gear roll on, the 10 year old suzuki would leave it handily. no problemo. why have a twin, if you need to downshift and rev it for torq? it would never match the Suzuki torq, even at max rpm? its 17 less, at twice the rpm? reads more like a small bike in specs. suzuki dry wait is 458? You’re comparing a 1250cc, water-cooled 4-cylinder that has been “tuned for torque” to a smaller, two-valve head, air-cooled twin compromised to meet Euro 4. It’s just no contest. Of course the Bandit is capable of making far more torque. And power. At whatever rpms the designers wish. Seems like you’d be under some strong Jedi mind control tricks to have to have a “Ducati” Scrambler over a faster, 29 pound lighter and $3996 less expensive MT-09. That is if you don’t mind have whiny engine. The 09 engine works just fine. But I, for one, cannot abide a whiny engine. Take away the whine and maybe we could talk. I liked the MT-07 better. It could use a bit more displacement/power and some better suspension. But the engine doesn’t whine and has a fairly lovable character. I rode both on a bunch of twisty bits in western France and eastern Germany. The Ducati engine really is a nice engine. It has goodness that you can’t measure with a dyno. It just seems to instinctively know how much power to make and when to make it. It gets really good traction coming out of corners. I had an ’03 1000DS Multistrada when I lived in Europe. The wife and I rode all kinds of crazy stuff and that thing seemed to love it all. If you’re wondering. I though some of the best riding I did was in Corsica. The repaved a bunch of the roads there for the Tour de France a few years back. And they have boat loads of deeply twisted tarmack. So twisted that you can easily brake for the goats and pigs that might be in the road. It’s a really cool place to ride. Hi Mick, could you elaborate on the “whiny”? Y’all are talking about the Yamaha triple? I’ve never heard anyone diss it before. This goes to the heart of what makes a bike engine a pleasure or a pain. Unless you experience a litre level V-Twin, you haven’t felt the instant torque available anytime anywhere, without effort. This means no need for the two or three gear shifts required for a multicylinder engine (three or four) before they offer the same kind of torque. But again, it arrives in a different fashion. The relaxing torque of a biggish V-Twin makes no demands of you, it’s just there, and means you can focus on cornering, relaxing, and enjoying the ride. With other engines, you spend more time and effort extracting motive power, and less on enjoying the process. You might arrive a nanosecond later than race pace, but you’ll be much less tired when you arrive, and your ride the next day will be so much easier and better. That’s why people don’t tour on sport bikes. They’re too hyper. If you have the personality of a hyperactive rat, you might be on meth, or if you simply have a death wish, a hyper speed sports bike might be your thing. But as Dirck has discovered, a fine handling, torquey big V-Twin can be a thing of beauty and a joy forever. I’ve owned a couple of liter class twins. They make wonderful torque and sounds, but any decent liter-4 makes just as much torque, with a broad, flat torque curve, and are almost universally more powerful. One only needs to try something like a Yamaha FZ1 to see that “twins make torque” is a little bit of a misnomer. If you have to down shift a couple times to find power on a bike you’re doing it wrong. Why did you shift so far up at such low speeds to begin with? Most multi-cylinder bikes have extremely wide power bands and don’t need to be shifted up (i.e. “short shifted”). There have been times I’ve left a stop light along side some guy on a big twin. For some reason, he’s already shifting into fourth by the other side of the intersection when I’m halfway through second gear. It seems to me like you need to shift more often on big “torquey” twins. Some guys are revvers, some guys are luggers. Never ridden a V Twin sport bike that liked to run below 4000 rpms. Honda’s, Suzuki’s, Moto Guzzi’s, Ducati’s..that goes for BMW’s flat twins as well. I have only ridden KTM singles so can’t speak about their V twins but I’d bet they are revvers too, never ridden an Aprilia. Liter class 4 cylinders will run all day between 1500 and 2500 rpms and pull like freight trains PLUS have a kick above 5000 rpms that will stretch your arms. Harleys and Indians like to run at low rpms but have no kick left after 4000 rpms. More to a motorcycle than a spec sheet. Sounds like one of those bikes that exceeds the sum of its parts. I don’t know why, but something about the design looks a bit off compared to the 800 Scrambler. The little Scrambler looks great. This one looks a bit clunky. Perhaps it looks better in person. I think the fuel tank is bigger and looks ponderous with a silver scab on its side, a completely useless scab which weighs something. Maybe so. The front wheel being larger than the rear also seems to mess up the proportions. And the undertail exhaust doesn’t look right in this application, either. I immediately thought of the Big Ruckus vs the little one, or how the latest MINI isn’t. First thing I’d have to do with this bike is re-route that crazy brake cable to its conventional location. Seriously, Ducati, you looped it up and over the speedo? Why?! Otherwise, between the seating position and overall specs, this seems like a less powerful-yet-still-coolor L-Twin take on something like the Yamaha XSR900. This is probably the Ducati I’d choose if someone turned me loose with a blank check in a Ducati store, with the proviso that I have to keep and ride the bike I buy, as opposed to selling it for profit. That is the standard brake hose routing for dirt bikes. The four Duc scramblers I’ve encountered in the wild were owned by millennials, actually. Just sayin’. Every one that I have seen in the wild is piloted by a flannel wearing hipster millenial. The only owner, and only Scrambler I’ve encountered outside a dealership is owned by a woman. I guess I stand corrected. Standard equipment for a dirt bike also includes 21″, skinny, spoked wheels sporting aggressive knobby tires, very long-travel suspension, loads of ground clearance, a skinny seat, and no giant, heavy, dual pipes suspended way up high beneath the rear of the seat. Oh, and dirt bikes don’t weigh 450+ lbs. Point being, this is 100% NOT a dirt bike. This is a street bike, through and through. Check out the fourth picture. The brake line looks utterly ridiculous sitting up there, looping over and around the instrument cluster, directly in the rider’s line of sight. Enough with the silly pretensions, Ducati. Rout the brake line where it belongs. I have been waiting patiently for a good ride review on this machine. Now I must figure out how to convince my wife I need another bike in the stable. The original Duc Scram would of been mine except for a typical Duc Design problem. The guys in Italy have very small feet, and there is no way to adjust the space between the gear shift lever and the left foot peg to a full size foot. Come on Ducati, look down ! They make aftermarket shift levers that should solve that problem I would think. I don’t know where you get your information but according to current anthropometric data the average Italian man has a size 10 foot just like the majority of his western counterparts. I also find it hard to believe that Ducati is importing machines that are not ergonomically correct for the US market. So . 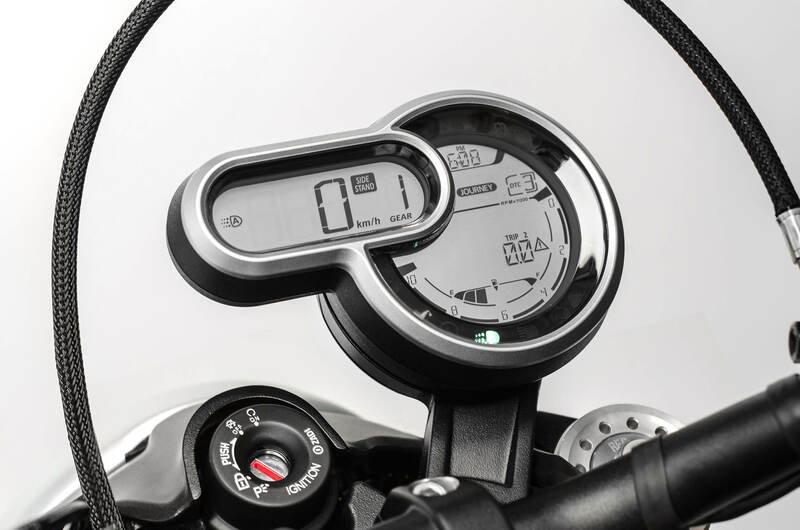 . . why does Ducati continue to make the distance between the left foot peg and the shift lever 5 inches or less ? All 3 modern Ducs I was interested in had the same problem, and there was no adjustability possible. Pretty metal works, but not even a splined shaft to relocate the shift lever a little. MUST be a design culture of small feet ore there. There’s a reason why my two up bike is a 2004 Multistrada. It’s because it contains one of the greatest street bike engines ever. The wife has already given me the green light on an NCR Ducati if I should even crash on my head hard enough to go into mid-life crisis mode. Make mine an air cooled 1100. But until some kind of mid life crisis bone grows in my head. I just don’t value street bikes their worth. I am a dirt biker, or even a mountain biker, first. Agreed. I owned a 2010 Hyper 1100 for several years and I still miss that bike. That bike was a brute with the dry clutch and all…..but a lovable brute. So you don’t consider riding a dirt bike and/or a MTB to be a symptom of manapause. I’d rather have the Kawasaki Z900RS or cafe. Just my thoughts. The -RS is a true gem. Motor everywhere and “intuitive” to ride.